Special, customized, one-of-a-kind Painted Gloves for you, your organization, and as unbeatable, memorable gifts for the baseball fan in your life. Custom Painted Gloves are perfect for collectors wanting to show their passion for the game, a player, or a team in a unique way and for big fans celebrating a special birthday, graduation or life event. 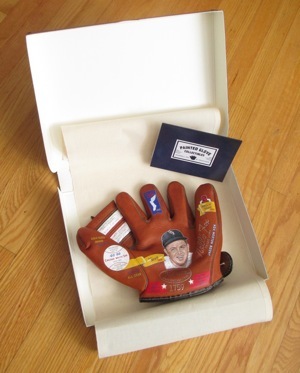 Painted Gloves are also a great fit for ball players commemorating their career or a milestone, teams thanking top sponsors and ticket holders, as awards, fundraising incentives, and more. I can depict favorite players, mascots, logos, even someone on a fantasy camp team -- you name it. These are special baseball keepsakes that will be enjoyed for years to come. I’m very comfortable and accustomed to working to client specifications and deadlines -- from Hall of Famers and MLB teams to individual collectors and gift-buyers -- and I'll be able to quote a price once the custom details are known. 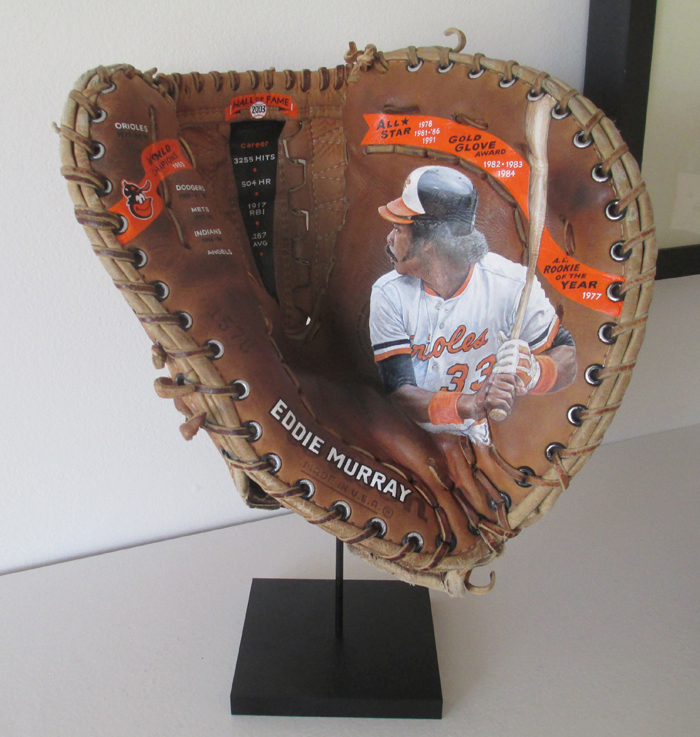 Pricing includes: Research and Glove purchase, custom design of baseball-themed graphics, photo reference and biographic research, hand-lettering and hand-painted realistic portrait(s), all of which is in the region of 120-150 hours per glove painting. Gloves arrive in a museum archival box with display stand. See unboxing video here. Free shipping and No sales tax for US deliveries. Framing or glass display case is available at additional cost plus shipping fees. RESERVE Your Painted Glove Today. Submit inquiry, email or call 519-836-5647. Share what you'd like to see on a glove. Submit an inquiry now or email sean@seankane.com . I'll determine pricing and delivery possibilities. A 50% down payment via credit card/PayPal will get the painting in schedule. I'll research and share appropriate glove options. You'll receive a design of plans for the painting to approve before painting begins. You'll see the completed painting before it ships out. Your Painted Glove arrives ready to display. Final payment due upon delivery. I’ll do whatever it takes to make this a great, personalized experience. Click to see video of Painted Glove being unpacked from delivery box. All deadlines will be specified in the order confirmation. On time delivery and satisfaction is guaranteed. Any questions about Custom Painted Glove artwork? Let me know! Lots of answers on the FAQ page, too. And see what others have said about my Painted Gloves. Please contact me via email or by phone at 519-836-5647.